Twelve times a week, 28-year-old Ella May Wiggins makes the two-mile trek to and from her job on the night shift at American Mill No. Two in Bessemer City, North Carolina. The insular community considers the mill’s owners – the newly arrived Goldberg brothers – white but not American and expects them to pay Ella May and other workers less because they toil alongside African Americans like Violet, Ella May’s best friend. While the dirty, hazardous job at the mill earns Ella May a paltry nine dollars for 72 hours of work each week, it’s the only opportunity she has. Her no-good husband, John, has run off again, and she must keep her four young children alive with whatever work she can find. When the union leaflets begin circulating, Ella May has a taste of hope, a yearning for the better life the organizers promise. But the mill owners, backed by other nefarious forces, claim the union is nothing but a front for the Bolshevik menace sweeping across Europe. To maintain their control, the owners will use every means in their power, including bloodshed, to prevent workers from banding together. On the night of the county’s biggest rally, Ella May, weighing the costs of her choice, makes up her mind to join the movement – a decision that will have lasting consequences for her children, her friends, her town – indeed all that she loves. Intertwining myriad voices, Wiley Cash brings to life the heartbreak and bravery of the now forgotten struggle of the labor movement in early 20th-century America – and pays tribute to the thousands of heroic women and men who risked their lives to win basic rights for all workers. 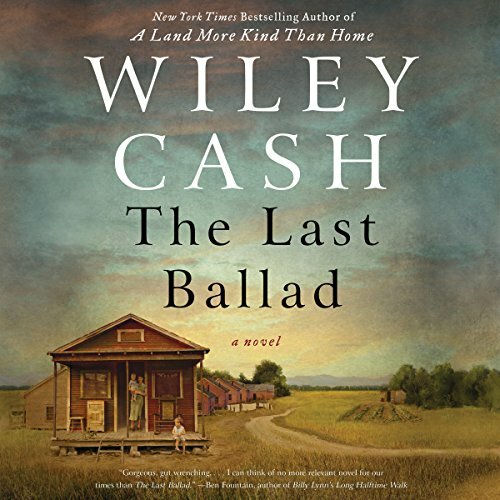 Lyrical, heartbreaking, and haunting, this eloquent novel confirms Wiley Cash’s place among our nation’s finest writers. I went back and forth about whether to listen to this book or not, and I’m really glad I decided to give it a try. I liked the story from the beginning and stayed hooked until the end. I liked Ella May. She lived and worked alongside her neighbors and friends, many of whom were African Americans, not very heard of during that time, and wanted what was best for them. She was only 28 yrs. old, but was raising four children, mainly alone, because her husband came and went as he pleased. I liked most all the characters in the book, especially Hampton Haywood and Katherine McAdam. I didn’t like the mill owners and the other “nefarious forces”. Because of them, many people were hurt or killed. I liked the alternating voices. The book is based on true facts and it is a very important part of our history. This is the first book by this author that I’ve read and now I want to read his other books. I’m not familiar with this one but I’m going to see if my library has the audio of this one 🙂 It sounds like a read that shouldn’t be missed. I hope your library has it, it’s worth reading. I’d love to listen to this one (on CDs). Excellent review, Vicki! I loved this and want to read more from him. This is high on my list. Maybe I’ll listen instead of read. I’m glad I choose to listen to it, the narration was great! Good to know about the audio – adding it to my list. I hope you like it as much as I do Mary! Good review Vicki. Sounds like one I would like! I’m glad you liked this one. I just checked my library and they have it on audio. Yay! I put my name on the list. I loved it on audio, hope you do too! I thought it was very interesting. I liked it a lot! If you do, I hope you enjoy it as much as I did!